The Concord PMC Kids Rides will be coming to the Willard Elementary School on Sunday, June 16, 2019. Kids ages 5 to 15 are invited to ride either a 1-, 4-, 8- or 12-mile route to raise money for the Dana-Farber Cancer Institute's Jimmy Fund while their families cheer them on and enjoy the event. Throughout the day there will be music and activities including face painting, crafts, bike decorating and field games. After the ride there will be a party with refreshments, music, and a rider fundraising recognition ceremony. All registered riders will receive a PMC Kids t-shirt and water bottle. There are no pets allowed at this event. Since the PMC Concord Kids Ride started in 2008, we have raised over $372,000 towards the fight against cancer. With your help, we look forward to making a significant contribution again this year. 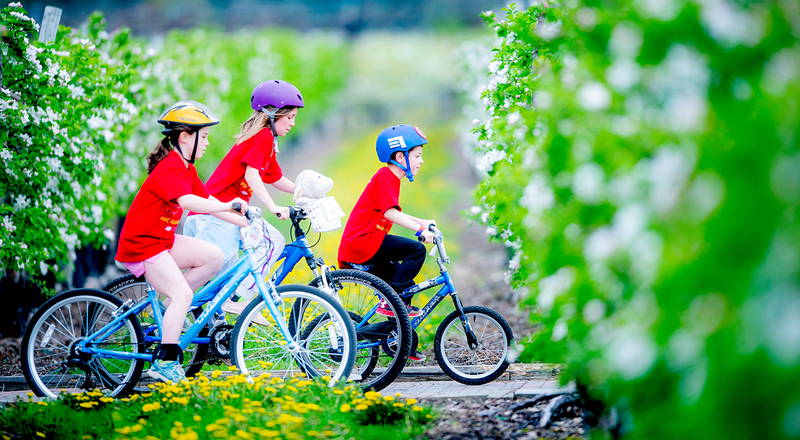 For safety, all PMC Kids riders must be off training wheels and there is a minimum 16-inch wheel size (to the tire edge) for the 1-, 4-, 8- or 12-mile routes. There will be a separate 1/4-1/2 mile PMC Kid Jr. Ride for riders with training wheels and those under 5. '47 supports the 2019 PMC Kids Rides program. Riders who register for the Concord PMC Kids Ride and pay a $20 registration fee will receive a $20 coupon to the Jersey St. store (19 Jersey St., Boston, MA) in their registration packet. Certain restrictions apply, coupons expire December 31, 2019). Wear a properly-fitted helmet (children and adults must wear helmets if they are riding). Ride in control – this is not a race. Hands should remain on handlebars. Never wear any kind of headphones. You need to hear clearly. Follow the ride guides and volunteers. If you need to slow down or stop to cross an intersection or obstacle, yell “slowing” or “stopping” to alert those behind you. Each PMC Kids Ride has a licensed medical professional on site. Get the entire family involved and support the event by volunteering! Be a ride marshal, work at a water stop, help with face painting and more.